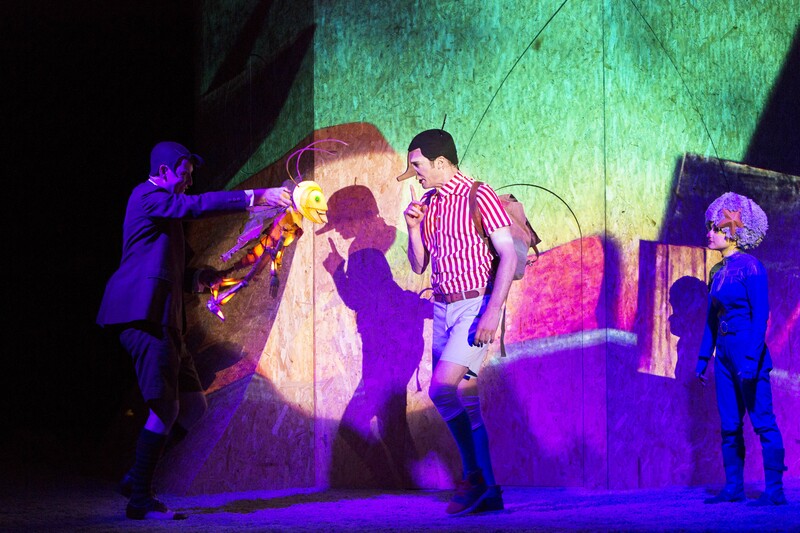 Sydney Opera House is presenting two children’s shows for the school holidays: Windmill Theatre’s Pinocchio and CDP Theatre Producers’ The Incredible Book Eating Boy. And with one end of the western foyer converted to a play area, it’s a lively place for families to be. Acclaimed Adelaide company Windmill Theatre, which makes adventurous shows for children, is in Sydney with its 2012 musical production of Pinocchio, presented by the Sydney Opera House and Sydney Theatre Company. Based on Carlo Collodi’s book about the wooden boy who longs to become real, director Rosemary Myers and writer Julianne O’Brien have created a version that combines a dark fairytale feel with a fun modern edge. It begins unexpectedly with a blue-haired girl crashing her motorbike into the tree from which Pinocchio will be carved (an underdeveloped take on the blue fairy, who we don’t see again until the second act). Then we’re into familiar territory with the tale of the naughty, easily led Pinocchio who is lured away from his maker/father the lonely toymaker Geppetto by the evil Stromboli. After a series of frightening adventures, Pinocchio returns home to Geppetto with love in his heart. With one section set in the reality TV-like Stromboliland, Windmill’s production is more of a cautionary tale about greed and the lure of celebrity, while raising questions about what is real, rather than about simply telling the truth. It’s cleverly staged around a large, flexible tree trunk on a revolving stage (designed by Jonathon Oxlade) onto which images are projected. The most charming effects, however, are the simpler theatrical ones – the way Geppeto carves Pinocchio, the way Pinocchio’s nose grows. There are excellent performances across the board. Nathan O’Keefe uses his lanky frame brilliantly as a larky, willful Pinocchio, Alirio Zavarce is touching as the soft-hearted, clown-like Geppetto, Paul Capsis is a deliciously wicked Stromboli, Jude Henshall and Luke Joslin are very funny as roving wannabes Kitty Poo and Foxy, Danielle Catanzariti is suitably ethereal as Blue Girl and Oxlade is delightfully whimsical as the cricket (for which he uses a puppet). Pinocchio runs around two hours including interval. For all its colourful treatment, it’s a fairly dark show (as is Collodi’s original story) and younger children could be frightened. It’s recommended for ages 7+. Jethro Woodward’s songs have an energetic rock vibe but I’m not sure they are pitched at children and some of the humour didn’t land with youngsters around me. Others clearly loved it, however, and the show got a rousing response at the end. For the littlies (aged 3+) the Opera House is presenting CDP Theatre Producers’ stage adaptation of Oliver Jeffers’ best-selling picture book The Incredible Book Eating Boy. Henry loves books – well, eating them anyway. The more he eats, the smarter he gets and so his appetite for the printed word grows and grows. But that many books are hard to digest. When he starts to feel ill and begins muddling up all the information he has consumed, he has to stop. Eventually, a sad Henry picks up one of his half-eaten books and begins to read it and falls in love with books afresh. Writer Maryam Master fleshes out the story with an opening nightmare and more about Henry’s family and cat, most of which works well though the extended cat poo joke feels overdone and gratuitous – in fact, it made me feel a bit sick. By the time Henry began regurgitating books, I was feeling almost as queasy as him. Directed by Frank Newman, the production is beautifully staged. 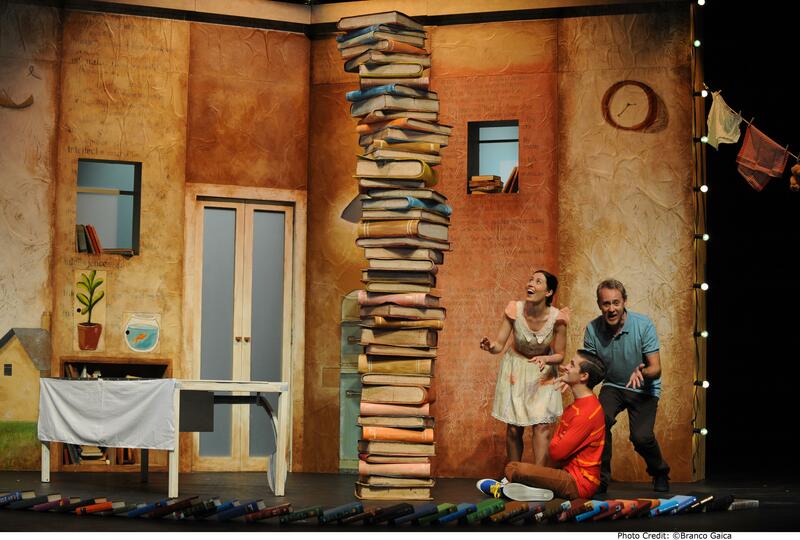 Andrea Espinoza’s lovely set and costumes have the look of a picture book while cleverly incorporating books into every aspect of the stage design. The cast of three – Gabriel Fancourt as Henry with Madeleine Jones and Jo Turner playing several roles – are all very good, creating characters the young audience can relate to. The message that it’s better to read books than chow down on them is a quirky way to inspire children. The production would benefit from a little more dramatic magic at the end when Henry finally discovers the joy of reading to underline how exciting books can be. As it is, he just smiles, so it’s the images of eating and vomiting books that we remember.